The St. Louis Blues have officially signed Martin Brodeur to a one-year contract. Brodeur leads the NHL with the most games played, wins and shutouts. With 688 wins, Brodeur could hit a personal milestone with 700 wins. Brian Elliott is officially out for the next few weeks with a knee injury, leaving an open space for Brodeur to show the league what he’s got. After a few practices, Hitchcock was satisfied that Brodeur was the same goaltender he’s watched for years. After a few hesitant plays, Brodeur gained confidence in his plays, even stopping the new the Forward on Fire, Vladimir Tarasenko, from scoring. Martin Brodeur’s overall record comes to 688-394-176, to go along with a 2.24 goals-against average and .912 save percentage. The St. Louis Blues have already taken to social media, along with a million Brodeur fans, to discuss the longtime Devil now donning a Blue Note. 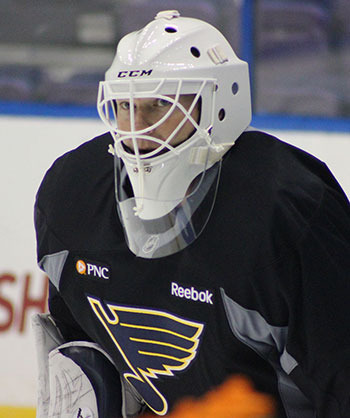 St. Louis Blues tweeted a picture of Brodeur’s new goalie mask as well. This new development could mean big things for the franchise. Jake Allen and Brian Elliott are a great team, but bringing in a major talent with an exceptional record could be the solidarity the Blues need to win a Stanley Cup. Allen and Elliott are sealed in for the Blues through 2017, so how much Brodeur could change the roster is still unclear. Brodeur is, however, expected to play right away, starting with the road trip to Nashville and then New York later this week and he is happy to do so. And so are we, Marty.